Raise your hand if you’ve ever cringed when your kids have said, “MOOOOMMMMM, I’M hungry!”? If you’re like me, you cringed because snacks are expensive. Snacks can easily eat up most of your grocery budget if you let them. And when you have multiple active children going through growth spurts, it can feel like it’s impossible to save money on snacks. Stop cringing, and breathe a sigh of relief. 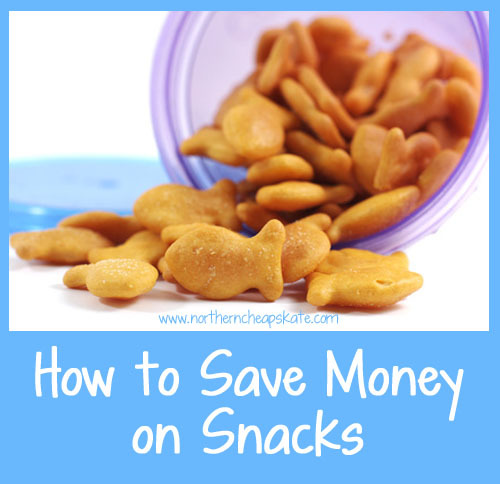 I’ve got a few ways you can save money on snacks. Make sure you’re really hungry. Are you truly hungry, or just thirsty? Drink a glass of water and wait 20 minutes. If you’re still hungry, then have a snack. Are you really hungry, or just bored? Find something else to do that doesn’t involve snacking. Eat filling meals. It’s okay to snack between meals, but if you eat a well-balanced meal with plenty of good protein and fiber in it, you’ll feel fuller and won’t need a snack (or at least, a much lighter snack). Avoid pre-portioned snacks. Individually packaged snacks are really expensive! Buy or make your own snacks in bulk, and then divide them into individual portions yourself. You can also save money by avoiding pre-washed and cut fruits and veggies and doing the work yourself. Use refillable ontainers. Snack baggies are convenient, but even when you use coupons, the expense can really add up. Those baggies are also bad for the environment. Keep a stash of reusable snack containers. You can portion out the servings in advance and then throw the containers in the dishwasher when you’re done. Watch those portion sizes. My kids love Goldfish crackers, but we were going through them at an alarming rate. The culprit – they were serving themselves HUGE portions. Measure out a proper portion size instead of “eyeballing it” and you’ll save money on snacks and keep those calories under control, too. Use coupons and cash back sites. If you just can’t resist those salty, crunchy or sweet store-bought snacks, then be sure to look for coupons and utilize cash back sites like IBotta. You can also look for deals on your favorite snacks using the Favado app on your smartphone. Make sure you calculate the cost per serving serving to ensure you’re getting the most bang for your buck. Eat wholesome, filling snacks. Less packaged food is not only better for the environment, it’s better for you and your wallet. Select fruits and veggies that are in season (or pick them fresh from your own garden). Many of the things you might snack on can be made at home for less, like popcorn, salsa, hummus, or graham crackers. And while nuts and berries can be a little pricier than a box of snack crackers or some pre-packaged cookies, they’ll keep you fuller longer and provide better nutrition. Limit juice, milk, and soft drinks. Water is, and will always be, the very best thing to drink, and as long as you’re getting it fresh from the tap, it will cost you next to nothing! At our house, the kids are only allowed one glass a juice a day (and that’s juice from concentrate). Milk is served with meals and soft drinks are only for very special occasions and when we are dining out. Establishing these beverage boundaries helps keep the grocery budget in check. Keeping those portions in check and shopping for bargains are the two best ways to save money on snacks and keep your weight in check. Make it light, make it fun, but don’t make it expensive!